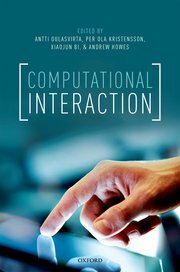 Computational interaction applies computational thinking (abstraction, automation, analysis) to explain and enhance interaction between a user and a system. It is underpinned by modelling which admits formal reasoning, and which is amenable to computational approaches. Computational interaction draws on insight from machine learning, signal processing, information theory, optimisation, Bayesian inference, control theory and formal modelling . It emphasises generating motor themes in HCI, and robust, replicable and durable approaches which go beyond point sampling of the interaction space. A number of summer schools, courses and tutorials have been held as part of the computational interaction movement. These are summarised below. Computational interaction emphasises transparency and reproducibility in research, and reusable computational concepts, algorithms, data sets, challenges and code. In that spirit, we provide online notes for all our courses, wherever possible in an executable format, using the Jupyter notebook format. We maintain an online bilbiography of relevant papers which are related to computational interaction.